Starting in the dark, cold months of December 2011, the London Borough of Lewisham set out on a mission…. Mission Impossible – To divert 2,629 tonnes to Recycling in 12 months! Hit with a surge of communications, from a variety of printed materials, livery and JCDecaux’s to events, presentations and social media residents couldn’t run and hide from our message which promoted a change of service and our 6 key recycling categories. Furthermore, we were rewarded for our efforts at the 2013 LARAC Conference and Celebration Awards! 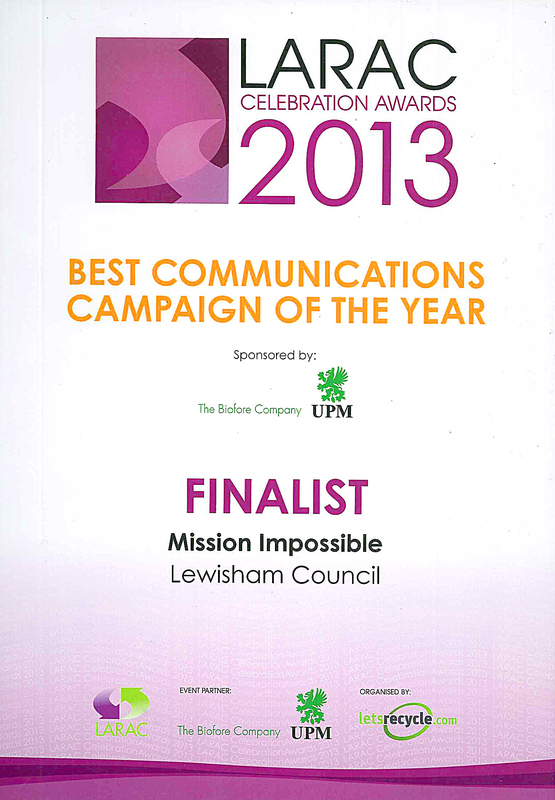 The Council were shortlisted for their excellent communications campaign. LARAC, the Local Authority Recycling Advisory Committee, recently held its annual national “Conference and Celebration Awards” with over 400 attendees attending a programme packed full of industry leading speakers, workshops, site visits and plenty of practical case studies. It was great to not only be appreciated by our local residents but also recognised by professional organisations within the industry and peers in Local Authorities throughout the UK.